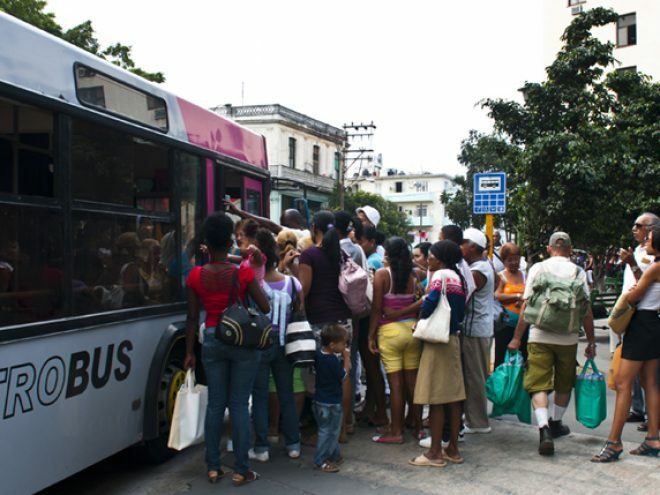 Opinion on Cuban buses (guagua) often ends up being sharply divided. On one side is anyone who has ever been on the Northern Line tube in rush hour (London’s tube) who struggles to see what the fuss is about when it comes to Cuban buses being full. On the other is anyone who has sat not moving for an hour or so in midsummer (with no air-conditioning) on a Cuban bus as some problem is fixed. Personally I think the truth is somewhere in between. On the one hand, the old converted articulated lorries (camellos) are a thing of the past and significant investments have improved reliability; on the other, it is frustrating to be in a bus when traffic runs so freely and in summer it does get hot, hot, hot! Cuba being Cuba, the bus is also an inherently social place. Flirting, talking, complaining, opining, suggesting, poking, prodding, touching, looking. This is not the cold dry London tube where no-one catches your glance. It is a sensual and involved tropical island where there is no idea of privacy or personal space. For better or worse.